As some of you may, or may not, know: Jen and I are moving in the next few weeks. Given this we have been in a race to eliminate as much from our freezer and pantry as humanly possible. 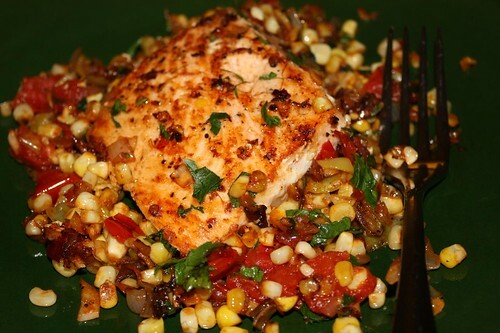 Last night we used up some nice salmon steaks with corn, peppers, onion, parsley, and tomato. This was all for the farm, except for the salmon, which was from a farm but not in the Hudson valley. 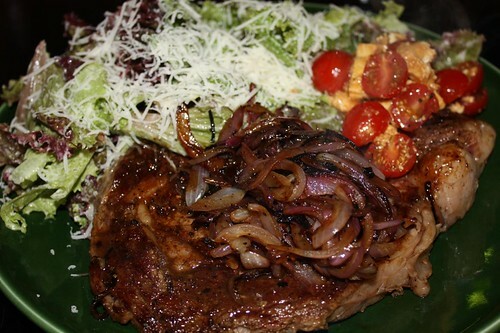 Tonight we went through some of the backed up salad greens, grape tomatoes, mozzarella, red onions, and half of a huge Ribeye from the freezer. I made a Caesar salad, a quick mix of mozzarella, balsamic, and tomato, then seared the half ribeye finishing it by killing the remainder of a bottle of Worchester sauce. In total dinner took about 12 minutes to make if you don't count the 15 minutes of doing dishes beforehand. It also utilized many ingredients that we need to burn through before our move. The coming weeks should present themselves with progressively unimpressive meals as we burn through our inventory until we find ourselves having a meal made from some miscellaneous dry pasta, canned tuna fish, and hoisin sauce. 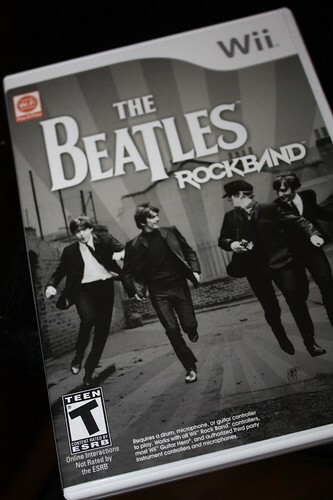 Oh, and we got The Beatles Rock Band in the mail today.